The nations and waters of the North Sea comprise the modern world’s most intensive sail transport environment. For those readers and sailors who have cheered on the Tres Hombres schooner-brig, and noted the creation of numerous sail transport projects here and there, the big eye-opener in terms of united international resolve can now be revealed: The European Union’s SAIL project, part of the North Sea Region Program whose theme is “Investing in the future.” SAIL’s mission is to bring about the construction and operation of the first Wind Assisted Ship Propulsion (WASP) large cargo ship. A 3.4-million euro fund is being put to use by transport specialists, port officials, academics, consultants and sailors to achieve this historic breakthrough in scale for large, technologically sophisticated wind-powered ships. 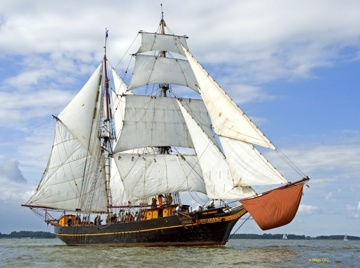 Managed by Holland’s province of Friesland, the home of the tall ship race in Harlingen, the SAIL project is well on its way to becoming a consortium as planned. At present seven nations are represented by 17 organizations. According to SAIL’s agenda, developing the WASP or “ecoliner” (depicted in the design diagram below) first requires a legal framework for building and operating the vessel. Then follow-up actions, all anticipated, will be undertaken. Input toward legislation will involve EU agencies and the International Maritime Organization (IMO). An EU member state must propose the WASP with a bulletproof document, but as one speaker warned, “In the EU, there is one green lobbyist per 100 industry-types.” However, the historic tide is turning in favor of wind propulsion. I attended as an American observer SAIL’s meeting held in mid April in Wilhelmshaven, western Germany. Professionalism and friendliness abounded, and keeping to the appointed SAIL tasks never flagged. My occasional input on peak oil seemed to be appreciated. Fortunately for me, English is the language of the conferences because not everyone speaks Dutch, for example. The technical presentations were not only admirable, but because they are coupled with practical insight on regulations and policy, the total weight of the conference information seemed to indicate a more logical approach within the EU than may be possible in the more politicized U.S.
With laws and regulations finally coming on to limit sulfur in the bunker fuel used by commercial shipping, particularly in the North Sea, the sail transport movement/trend fits into the global shipping industry’s Energy Efficiency Design Index (EEDI). This is because wind in sails is an allowed “innovative propulsion technology.” The EEDI is a necessary mechanism for functioning on the water, so it is adhered to in SAIL’s regulatory and business-model considerations. Such issues are thoroughly discussed and implemented by SAIL and its participants, particularly through ongoing Work Packages between meetings. The genesis of the SAIL consortium was a conversation by two Dutch sailors: Robbert van Hasselt and Arjen van der Veen. They voiced the idea of the EU’s supporting the construction of the Ecoliner as envisioned by Arjen van der Veen’s organization Fair Transport. Since then the project has proceeded apace, under the leadership of Anne J. de Vries, project manager for SAIL whose Lead Partner is the Province of Fryslân (Friesland) in northern Holland. Some individuals participating appear to be less buoyant than others regarding the future of sail power on a large scale, anticipating longer-term oil dependence. At least peak oil and climate trends are denied by no one (contrary to what might happen in the U.S. with some interest groups). 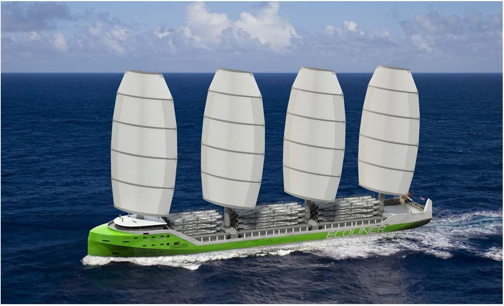 Regardless of differences in outlook for the longevity of oil-fired cargo shipping, all SAIL participants see a role for wind power over the waves, at least with kite sails that can be implemented immediately. Yet all SAIL’s organizations are on board for the Ecoliner goal. 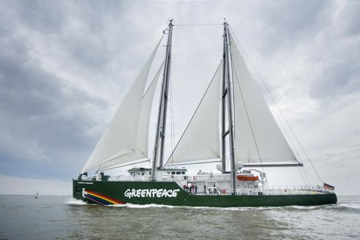 The designer of the prototype vessel, Dykstra & Partners, naval architects of Holland, bolstered its credibility at the meeting by giving an additional presentation on the new Rainbow Warrior III, the Greenpeace motorsailer that comes with a helipad. It has sailed well and not relied too much on the engine (see photo below). The Dykstra presentation allowed that the sails for the WASP Ecoliner may not be the “Dynarig” as shown here, but rather the Flettner rotors which look like fat smokestacks. Also considered were “wing sails” that resemble vertical airplane wings. These rigging systems require little human power and lack the extensive ropes that interfere in loading and unloading cargo. The rise of sail power and the next economy — steady state and living more ecologically — is underway. The European Union’s interrelated corporate-dominated economy continues, but steadily weaker under the grip of massive debt and maldistribution of financial wealth. Less acknowledged is recent unsustainable growth of population and consuming. Looking at this trend honestly is not yet fashionable, and there is almost no planning to bring about a realistic alternative. However, there is the bright spot of sail transport developing in northern Europe. In addition to the well publicized private-sector endeavor of B9 Shipping to build a hybrid sail freight ship, the EU-supported SAIL project is making rapid headway. With the capability of moving large, commercial cargoes via renewable energy, Wind Assisted Ship Propulsion is attracting potential investment. Approximately 20-million euro will be required to build the ship. Practically all stakeholders, minus so far the freight owners, are involved and doing their level best as top academics, engineers, sailing entities, and other players work together methodically. Working groups and progress reports are advancing. When it comes to free-market imperatives, Jorne Langelaan (a Tres Hombres captain) pointed out that “it is the cargo owners who can insist on zero emissions, whereas ship owners are just in between.” By the next meeting in November in Rotterdam, interest in sail-transported projects will have no doubt grown after the successful summer season by Fair Transport, TOWT and other clean, green shippers. To sail into a sustainable future, SAIL calls on freight owners to step up now and help usher in the Ecoliner in their own interests. By doing business via sail transport today, the necessary investment for Wind Assisted Ship Propulsion will come about! Participation is encouraged, which is why SAIL offers its contact information below. Thepitchbook for the “Ecoliner: Shipping Without Footprint” is public as well. SAIL’s visionary process is joyful to witness, even as intractable problems of climate change, insanely high import levels based on distant manufacture, oil dependence, etc., are ominous background issues. Yet, they do not cloud or stymie progress in the revival of sail power. Indeed, the New Age of Sail feeds upon the forces bringing to a close the unsustainable fossil-fueled economy and its dirty-fuel shipping sector. Contact SAIL: To subscribe to the SAIL Newsletter, go to this website form where you can also pose any questions or remarks about the interreg IVB project SAIL. For the LinkedIn Group “SAIL: a partnership aiming at promoting, developing and operating of hybrid sailingships,”connect here. 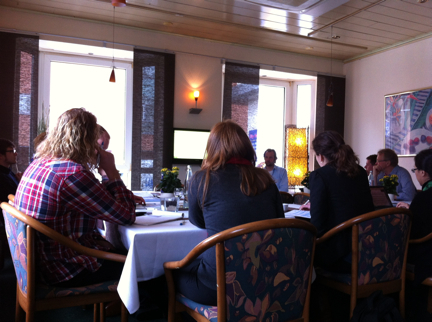 See the SAIL website nsrsail.eu for coming events and the April 2013 PowerPoint presentations. For a graphic description of how SAIL’s process works, see the NSR Interreg project from 2011. Status of major shipping, from the oil dependent perspective: Smoking Ban: Shipping Shifts to Cleaner Fuel in Der Spiegel online in English. Rolls-Royce Revives Age of Sail to Beat Fuel-Cost Surge featuring B9 Shipping’s cargo sailing ship development.